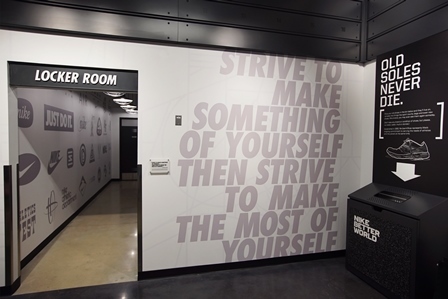 Located in gentrifying and lower-socioeconomic neighborhoods, the Nike Community store's mission is focused on empowering the local community through sport. They achieve this through hiring locally, partnering with local organizations and volunteerism. In 2015, Nike will launch multiple community stores across the US. In collaboration with Portland-based Tether, we set the visual and storytelling direction for all of Nike's Community Stores launching in 2015 and beyond. This included all out-of-home and in-store installations as well as grand opening activations for their DC, Brooklyn and Portland stores. Our role at Ripple included research on the local community, connecting with community partners on the ground, and collaboration with the Design team to tell an authentic story both in-store and out-of-home that would connect to the local community.